I noticed that my clock signal out from ES-3 via SW Sync is only 0.4V. That seems very low. Various other HW seems to work with 1.25V as a high signal. The low clock output from ES-3 causes problems with syncing some of my HW, namely my Koma Komplex. I have found no specs regarding what output voltage to expect for the ES-3, but I assume that it should be higher than 0.4V for the clock. Find attached my settings. Anything I do wrong? http://expert-sleepers.co.uk/es3.html says it produces ±10V, which is correct. You must be attenuating the signal, either in Logic or your audio interface's mixer. That is in fact the case, I have had the fader in -4DB as it was "in the red" otherwise. To get to 1.25V I need to have the fader at +2db, which I still find strange, but ok, it works. So thanks for pointing it out. You should leave the fader at 0dB, which should give you a 10V signal from the ES-3. If not, then something else is misconfigured. Thanks, but sorry to say I have no idea what that could be. I am using the Focusright Clarett 8pre via thunderbolt from my Mac; and from the Clarett to Es-3 lightpipe. Focusright control gives me no settings for these "route through" channels. So it can only be Logic itself. I have no idea. 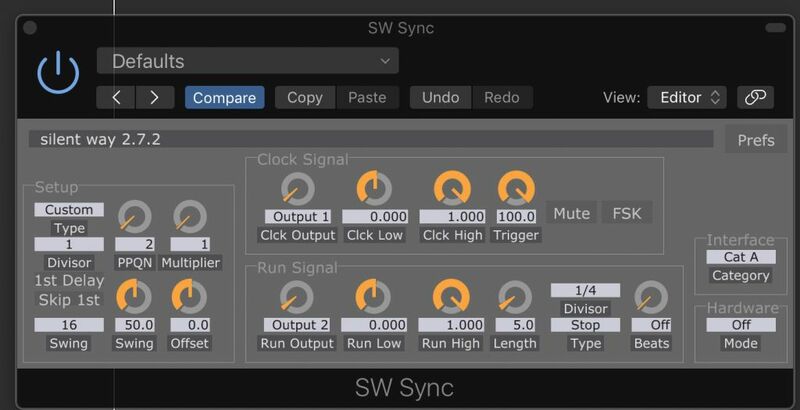 Are any other users of Logic and the SW Sync (AU) here that can share their setup?